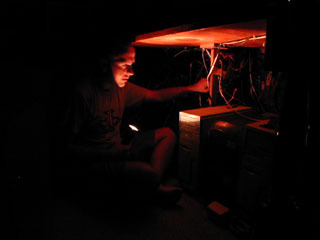 In darkness, Chris Johnson checks the computers and wiring as the Odyssey temporarily lost all electrical power. This is Roger Payne speaking to you from the Odyssey. Last night while motoring slowly along, the total power outage I had feared finally came. We had stopped the engine to listen for whales, but found that when we tried to start it again that the starting batteries were so low they wouldn't turn it over. Realizing that once we managed to restart it we would not want to take a chance of turning it off again, I decided that this was the last chance we would have to get the silence we needed to record the Voice From the Sea piece I had done for this website. So, with the entire boat in pitch darkness, reeling about in its own stately fashion on a sea too calm to sail, and with Josh (bless his heart) lying on the floor of the engine room, struggling with our generator's broken water pump (so he could start it just long enough to have it start the main engine) Chris and I found ourselves completely removed from the entire crisis, leaving its solution in the hands of others as we used the batteries in my computer and those in his recorder to record my piece. Success, we thought. But later in the night when Josh had gotten the engine going-by employing a clever, Josh-trick that meant he didn't have to start the ailing generator after all… and when all was up and running again, and the welcome sound of the motor (which I had always wished I didn't have to listen to before) was warming all our hearts, and after I had gone to my bunk and was sleeping, Chris, who was still up and working late, found that the tape we had used to do the recording was faulty and that we would have to do it all over again. It is ever thus. How rare is it to hit a tape that was made with a fault? We buy good tapes, but this one was faulty. I suspect that bad tapes in our price range are a very rare occurrence. We arrived in Madang this afternoon, a beautiful, calm day with blue skies, our long trip behind us, our data logs crammed with fresh information, a shelf of phials with new samples in them, and more in the freezer, and the satisfaction of having seen our visiting scientist from Denmark, Peter Taglberg Madsen, get the data on sperm whales that he needed to complete his Ph.D. dissertation. When we first arrived in Madang, Josh went to see if our other dingy and our other generator had been repaired. The answer from the boat yard was almost: "What, are you kidding?" So Josh removed the water pump off our still defunct other generator, brought it back to the Odyssey, and installed it. The sick have been healed, the broken mended, and the generator aboard Odyssey works. The air conditioner works, in fact everything is working. So now I sit in my cabin with its temperature at 71 degrees Fahrenheit, while outside in Madang it is a stifling 90 degrees. Electrical power performs miracles. I am glad to have it back in our lives. So we are now lying calmly at anchor in Madang harbor, New Guinea-the end of nearly a month at sea-the end of nearly constant motion, which leaves me feeling that something is missing… and then I realize that it is the discomfort of fighting the boat all the time that is missing, though once I am back in Vermont I know I shall miss the constant stately motion of the sea in my life. The day after tomorrow I will start my long 40 hour flight home. This is a lovely town where many of the trees are festooned with flying foxes, hanging in clusters like ripe fruit from the upper branches of their roosting trees. During the day they appear to fan themselves gently with their wings. It is done in several ways and seems to be performed most by those that find themselves hanging in the sun. One technique is to unfurl a wing, and, while holding it open in front of their bodies (like a waiter standing by for your order with a towel over his arm), to move that wing slowly in and out. In another technique they open one wing fully and stretch it down until it extends well below their heads. Then, while keeping it fully extended, they tremble it and wave it about a bit before slowly (it seems almost reluctantly) refurling it. 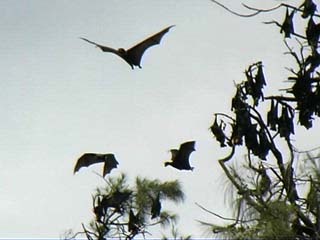 At sunset the flying foxes all leave their Madang roosts and many of them set out across a short stretch of sea towards the surrounding countryside, where they presumably search for the fruit trees and large flowers on which they feed. As they are crossing the water near us by the thousands-we very occasionally see one drop down to the surface and touch it with its mouth, appearing to drink. Back on April 9th in one of her logs, Gen Johnson postulated that maybe they did this as a means of getting the minerals they need. Since it is done by so very few of the thousands of bats passing overhead it seems equally plausible to me that the drinkers may simply be inexperienced animals who have mistaken this almost land-locked bay (it looks very unlike the open sea) for a body of freshwater. If so, how many times do they have to make such a mistake before they learn? Judging from the thousands that are not doing it, they may learn fast. This is Roger Payne signing off. So ends this day.